This entry was posted on December 20, 2016 by Jessica Anderson. As 2016 draws to a close, its time to wrap up your awards programs for the year. January brings one of our busiest months of the year with a plethora of corporate plaques, President's Awards, sales achievement and other yearly recognition. Below are 5 examples of year end corporate awards our customers provide to individuals within their organization. These pretty purple YAHOO! acrylic awards were a hit with the winners! 1. Awards for an Annual Ceremony. The award you choose is an extremely important component of this occasion, and fortunately there are many options for any sized budget. Read 5 Tips for Choosing a Corporate Award or contact our staff to help you choose the perfect award to make your winners proud. For ideas on hosting an event, read my post on Planning an Awards Ceremony. 2. Service Awards. Reward those employees who commit to your company for an extended period of time with a Service Award. Present this award to 1, 5, 10 and 20 years of service, or tailor the time frame to your organization's specific needs. In addition to awards, clocks, gift certificates to a special store, and personalized gifts are popular for this type of recognition. Rule of thumb is the longer an individual is at the organization, the more significant the award. 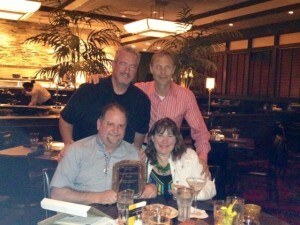 Our customer presenting a sales award plaque to a distributor. 3. Sales Awards. Celebrate reaching goals and achieving quotas monthly, quarterly, or annually, as your recognition program and budget allows. Depending on your business, a sales award can be an individual award for a specific person, or a group award for a top store, regional leader, or top distributor. Plaques, acrylic awards, glass awards and etched crystal awards are popular options. Read the Sales Achievement Awards post to learn more. 4. Employee of the Month Awards. This can also be Employee of the Quarter or Employee of the Year. As with any awards program, its important to decide on the criteria for choosing the winner prior to launching the program. When a person is selected for the award, be sure to publicize it. This has two benefits - the winner feels important and others are motivated to win in the future. For the award, perpetual plaques posted in a central location are most popular. It's also nice to give a small take-away award to each winner to display on their desk or bookcase to memorialize their honor. 5. Other Types of Awards. 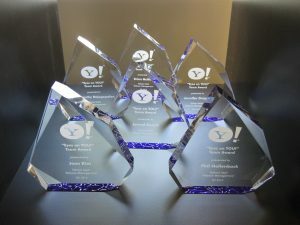 These include community awards, corporate honors, leadership awards, product launch awards, past president, retirement gifts, and teamwork awards. Many organizations create their own awards too, tailoring the recognition specifically to their need. It's important to set up a recognition program carefully before launching to ensure success. But once it's implemented, measured and executed, corporate awards programs can improve your company culture and increase your staff morale. Feel free contact me or any of our staff for more information about End of Year Corporate Awards! Here's to a great 2016 and a wonderful new year ahead! Editor's Note: This post was originally published in December 2013, and has been updated for accuracy and comprehensiveness.